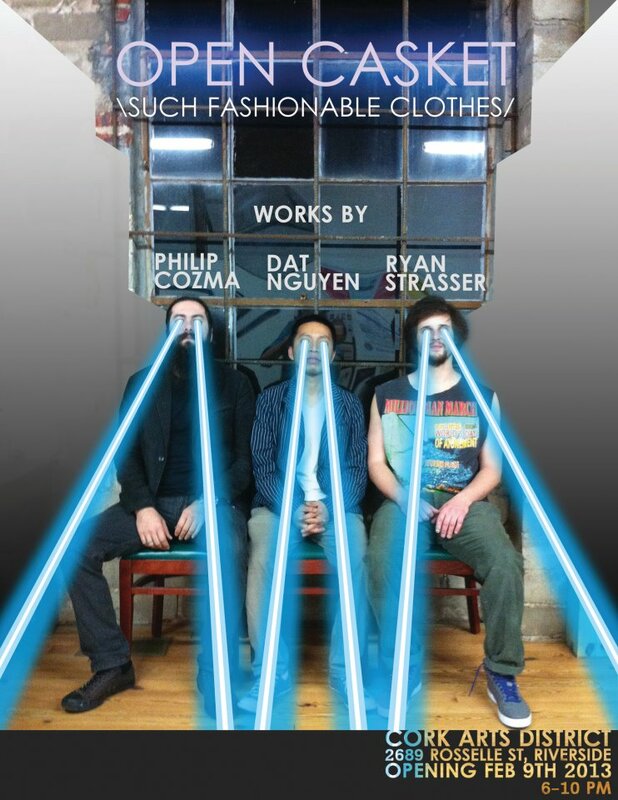 On Saturday, Feb. 9, Ryan Strasser, Dat Nguyen and Philip Cozma unveil their group show “Open Casket” at CoRK in the Riverside district. While these three artists have their own distinct and signature styles, they also seem to share some similarities in regards to delivering somewhat cryptic, or at least otherworldly, works of art that touch on the personal, political and playfully absurd. In a near self-destructive feat of editorial peacockery, the quasi-journalistic consortium currently self-branding as STAREHOUSE attempted to e-mail out questions to the participating artists and then have the answers and images posted in less than 48 hours – hoping to have this online before the day of the opening reception. In that regard, we have succeeded. However, whether or not the story is a success is once again contingent on you, our much-loved reader. We would also like to thank the artists for both participating in the interview, as well as agreeing to the highly abbreviated deadline. Below is a transcription of the Q & A with Strasser, Nguyen and Cozma. Starehouse: What do you feel is your own personal impetus for (and contribution to) the “Open Casket” show? S.: What type (i.e. paintings/sculptures, etc…) and how many pieces are you presenting in show? S.: The press release for the show states that collectively, your work will “explore the dichotomous themes of life and death, waking and dreaming and freedom and captivity” – could you please elaborate on how your own work will explore those themes? R.S. : There’s an infinite amount of things that can do an infinite amount of things to or because of an infinite amount of things. “To or because of” or “because of to” is the quad-chotomy… lol. S.: What are some of the characteristics that you admire about the work of your fellow “Open Casket” artists? Philip has massive technical skill, canvases and subjects to match. He has an unmatched ability to enter your personal space with a monolithic battle god. S.: I know you of you primarily as a painter, yet you are apparently also displaying shadow boxes in this particular show. What compelled you to explore that medium? R.S. : I collect what I consider significant objects. And these collages give me a chance to show how they are significant. Included in this collection are piles of old prints, photos, drawings, paintings… that I have made. Doing this kind of work gets me in touch with the progressing narratives of my work. S.: I kind of know you more as a figurative/portraiture or at least representational painter. 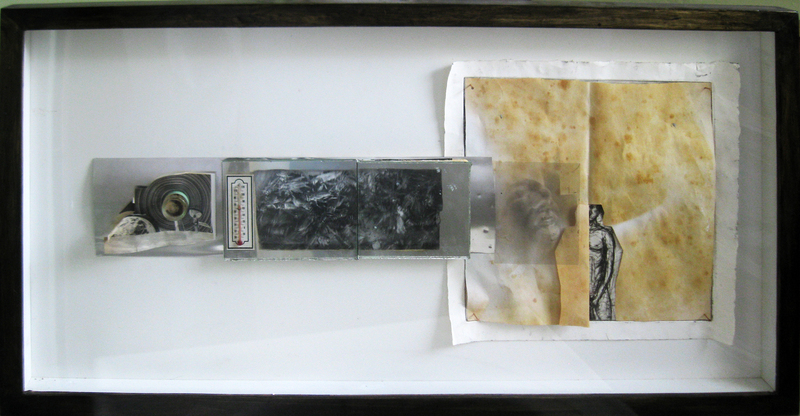 How did you reconcile that approach or history with the creation of these shadow boxes? R.S. : I disregarded it completely and loved doing so! S.: The statement for the show also states that these new assemblage shadow boxes “which open a window to an instant in some reality neither real nor fantasy but grounded in tactile experience.” Could you elaborate on that concept? What do you mean by a reality that is “neither real nor fantasy”? Could you give me an example, possibly as an anecdote from your own life that would illustrate that occurring? R.S. : One time I saw a man about 30 years old with cerebral palsy go to the ATM. Was my feeling of waste, uselessness, unfairness and regret in that moment real or did I dream it up as an epithetical response to what I perceived to be his plight? I didn’t have any interaction with this person. I think the best way to describe my reaction is as being neither real or fantasy but it was some sort of tactile experience. S.: What are you currently working on? What is the status of [Strasser’s indie rock band] “After the Bomb, Baby!” – is the band still an active entity or on permanent hiatus? R.S. : I want to put together this performance piece for One Spark but it’s going to cost around $5,000.00 to pull off. Maybe I’ll make some cash at this show … LOL. Everything will be priced as usual … Free if I like you. More than you’ll pay otherwise. I have started collecting discarded bed box springs. I am going to stretch bed sheets on them and paint bed scenes. ATBB is alive. We have a show for Void coming up I think in March and a show at Sun-Ray Cinema in early April. Dat Nguyen: I’ve known Philip and Ryan for a long time but we haven’t done any show together. We always interested in each other’s works and we all think that this is the right time for us to show that progress and more importantly to have a reason to hang out. D.N. : I’m showing 7 paintings. D.N. : Philip and me shared somewhat similar childhood experience in Romania and Vietnam, we both got brainwashed with communist ideology and witnessed the transition of black and white television to color-television. I admired his determination to revisit the past and his grand works are quite impressive. Ryan’s works, whether it’s collage, drawing or paintings, are always funny, nimble, and wondrous. S.: The release for this show also explains that your work consists of “dreamy pieces evoke partially remembered déjà vu realism.” Could you elaborate on that description? D.N. : Actually that phrase was coined by Taylor, Ryan’s brother. It’s pretty good isn’t it? I think it’s reasonable descriptive about the works, which consisted of banal happenings yet the space seems to be non-Euclidean, the light source is unclear, the anatomy is not precise, the colors are indecisive, and the viewer’s perspective is somewhere midair. S.: Looking at older work, it seems like your pieces run the gamut from the surreal (such as “What Is to Be Done?”) to the cryptic (“Yellow India”) to more traditional cityscapes. I guess I am curious as to where you feel like your work is heading now. The image that you sent me of a piece to be featured in “Open Casket” shows an image of a figure lifting weights as what appears to be a child wearing a “Goofy” mask stands in the doorway. What is the inspiration behind this? Is there a direct narrative or is it more of an “open door” for the viewer to explore? D.N. : My way of creating is impulsive. I have no plan or system. 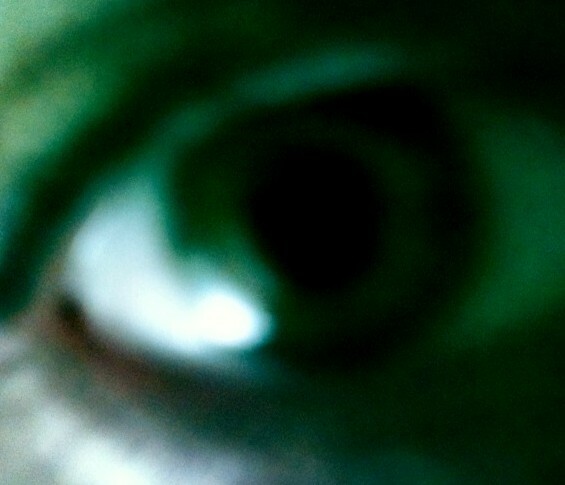 If I witness or read something that moves me in some way I’ll create something to respond to it. 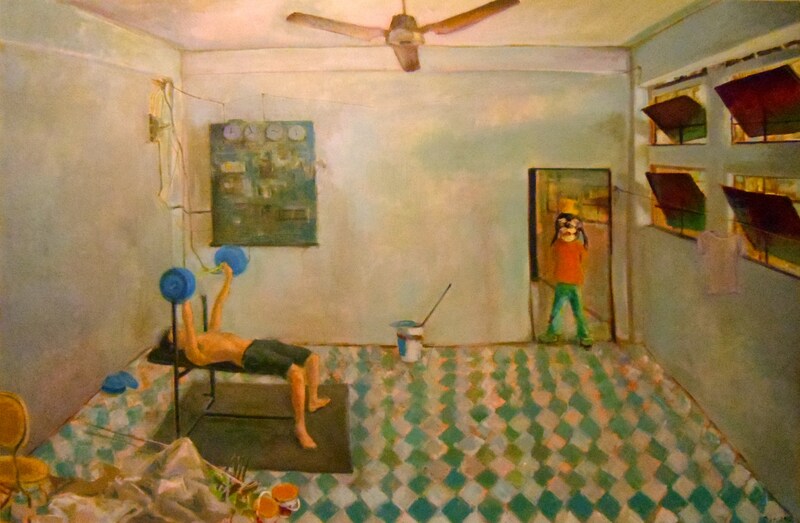 For this particular piece “Goofy”, I saw a young guy doing weightlifting in a decaying theater that belonged to the French colonial time, and the image, for me, illuminated a part of life in the modern Vietnam. As I finishing the painting, my two nieces, who are avid Disney fans, insisted me to include a Disney character. I laughed it off but I reconsider and think that the kids are absolutely right. After a civilized negotiation, we agree to include Goofy. The kids didn’t get Cinderella as they wanted but they’re happy that their opinion mattered. I think adding Goofy, an American, makes the concept behind it way more interesting. S.: You recently returned back to Northeast Florida from an extended visit to Vietnam. I’m wondering if you would share some notable impressions from that journey and also equally curious how that experience might have “shown up” in the work to be featured in this show. D.N. : I met an expatriate in Saigon who complained that when he’s in the U.S. he’d miss the warmth and friendliness of the Vietnamese and the chaos of city, and when he’s in Vietnam he’d miss the sterile city and the country where everyone just wants everyone to be as far away from each other as possible. I felt the same way too as I lived there for a year. For this show I’m showing a series of highway images. These series express that odd feeling of isolation and freedom. S.: What are you currently working on? D.N. : Nothing much, but i think i need to find myself a job first. Philip Cozma: My contribution to the show is shedding light on an, often times, glorified masculine identity aided by advanced scientific development that becomes an extension of modern man’s idealism. It is this intoxicating fascination with things mechanical and complex technology, as a whole. P.C. : I have six oil paintings in the show. P.C. : My work delivers the Freedom and Captivity theme by investigating the relationship between man and the suit he must wear to become one with the machine. It is the race for progress that keeps us free to dream and escape along the x and y axis yet captive within that technology and at a dangerous disconnect with the natural environment. P.C. : Ryan’s work has a certain fearlessness to it that allows him to approach subject matter from an entirely new perspective. He reflects the possibilities of an innate human nature that demands and challenges the viewer to a certain self-evaluation. Dat’s experimental color pallet and alternate perspective gives his work a captivating mystery, and in turn, opens the viewer’s perception to a lost subliminal truth. S.: The press release for this show also states that your “tightly controlled propaganda pieces plunge the viewer into a totalitarian nightmare.” Could you please elaborate on that comment? It also seems as if your work might be the most overtly “political” of the three featured artists. Would you agree with that observation? P.C.: . I think powerful nations, throughout history, had to master some technology that allowed them to achieve their respective culmination. When I investigate this subject matter I look to capture man’s relentless quest for power through technology. I’m not trying to make my work political; it only comes across that way through subtle visual cues. 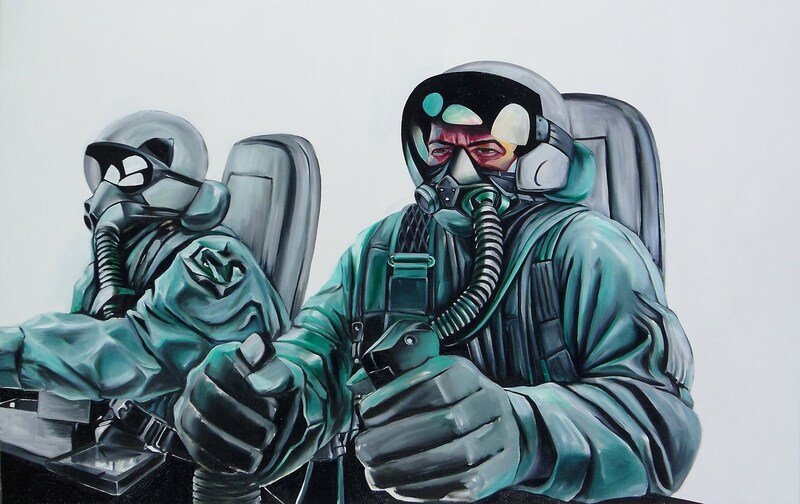 S.: The image that you sent me for “Open Casket” features what appears to be of two fighter pilots. A few pieces on your site feature similar combat or aggressive imagery; other pieces, particularly the “CCCP” piece featuring the Cosmonaut figure in space (ostensibly titled “Yuri Gagarin, First Man in Space”) also seem to touch on propaganda-style and war-like imagery. What compels you to utilize these ideas or motifs? P.C. : I grew up collecting stamps from across the world. A lot of them were Bauhaus-styled, propaganda themed imagery of an idealized Space Age society with an abundance of geometry and color. It was my dominant source for visual inspiration and nurtured my drive for making art as a child. It carried through over the years which I still make evident in some of my work today. S.: I know that you (along with Ryan) are also a designer. Of the three artists featured in “Open Casket” your work seems to have more overt or direct design elements, especially in your use of iconic/futuristic images. Do you agree with that observation? Also, what is your apparent fascination with these almost anachronistic images/motifs of sci-fi figures and robots? P.C. : That is a fair observation. Both Ryan and I did study graphic design. I feel it’s only natural that it would influence our personal styles as we develop further. I have always been fascinated by the look of industrial machines and vehicles. As a child I always dreamt about utopian, “Jetsonian” worlds with flying cars and talking robots. I was always fascinated by futuristic and aerodynamic things and looked to design and illustrate my own dream machines. S.: What else are you currently working on? P.C. : Right now I continue to elaborate on the same subject matter. This entry was posted in art and tagged Dat Nguyen, Philip Cozma, Ryan Strasser on February 8, 2013 by starehouse. As always, thought provoking work steered by questions that direct my attention towards developing a richer understanding of art.